Vintage Threads: Alphabet Adventures - "E is for Eyeglass Case"
Alphabet Adventures - "E is for Eyeglass Case"
Today is brought to you by the Letter E. E is for eyeglasses. 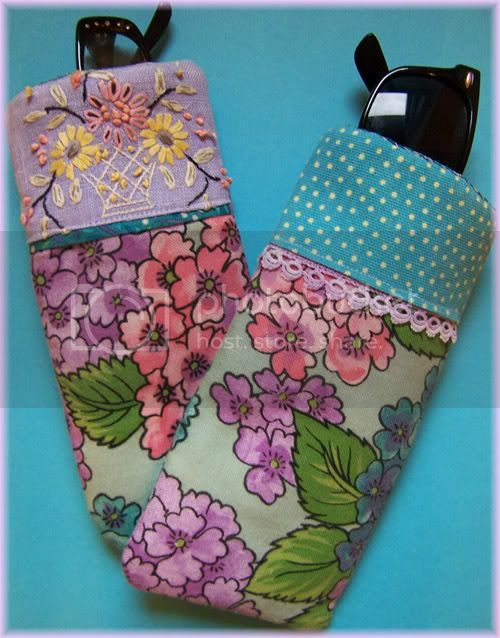 I made these cases from a vintage hydrangea print, circa 50s/60s, and some fragments from a vintage tea towel. They are quick and easy to whip up. They'd make great stocking stuffers and are a great way to use up small bits of fabric and trims. 1) Trace a rectangle around the glasses leaving adequate room for sliding in and out and a 1/4 inch seam. Use this shape for the pattern. One pair I rounded the bottom and the other I left square. 2) Cut two pieces for outside shell. Two for liner. And two of fusible fleece (thin stuff you use to make placemats and such with). Fuse fleece to exterior shell. 3) Decide on trims and cut those to fit. Attach trims. 4) Put right sides together of lining and stitch around outside edge with 1/4 seam. Leave top open. Put right sides together of exterior shell and stitch in the same manner. Flip exterior shell to right side. Leave lining with wrong sides out. 5) Slip the lining inside the exterior shell. Align upper raw edges. Turn under raw edges to inside 1/4 inch. Slipstitch edges together. That's super cute! I love the embroidery on the top. That case is so cute! What a great idea. So cute! I was hoping to make a couple of these for stocking stuffers for Christmas this year. Did you use a pattern, or can you describe your process? Thanks! Very cute! I love the bright and cheerful fabrics and trims. Great idea for a stocking stuffer. How very cool! A useful item that also looks super cute! I love it.